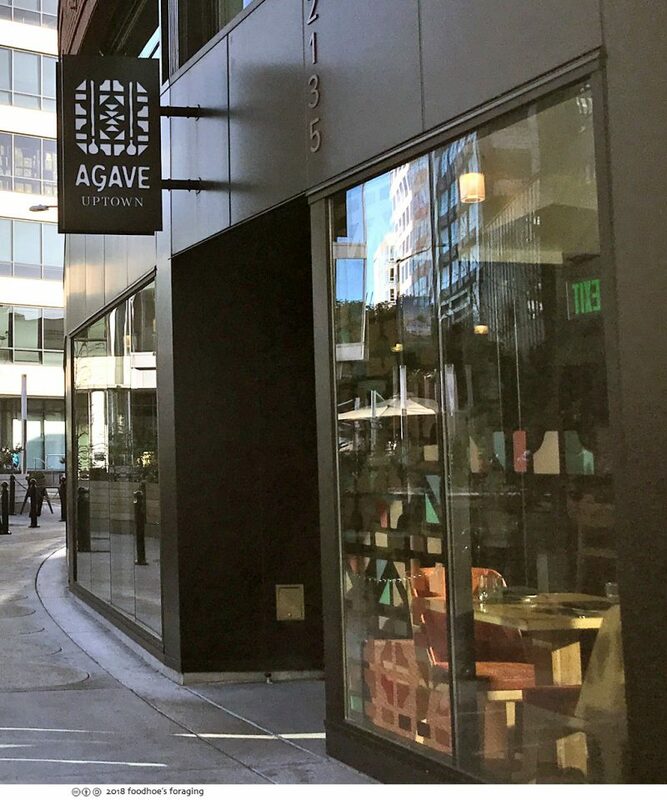 We had a great meal at Agave Uptown recently, the latest restaurant from Chef Octavio Diaz who brings traditional Oaxacan food with a focus on authentic mole and mezcal to the hip Uptown section of Oakland. 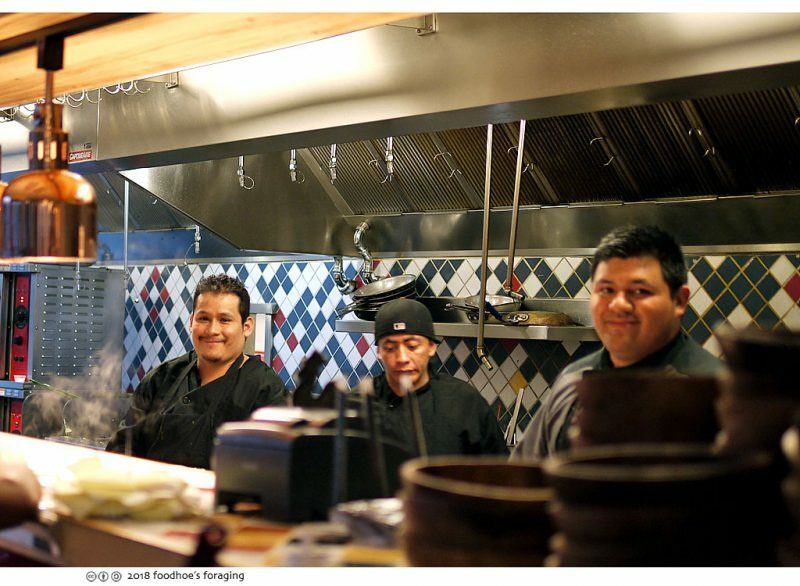 The chef has another Oaxacan eatery called Agave Mexican Restaurant and Tequila Bar and is co-0wner of Casa del Mole, a grocery and taquería both in Healdsburg. The new location is on the first floor of the Kapor Center for Social Impact whose mission is to narrow gaps in opportunity and access for underrepresented communities. 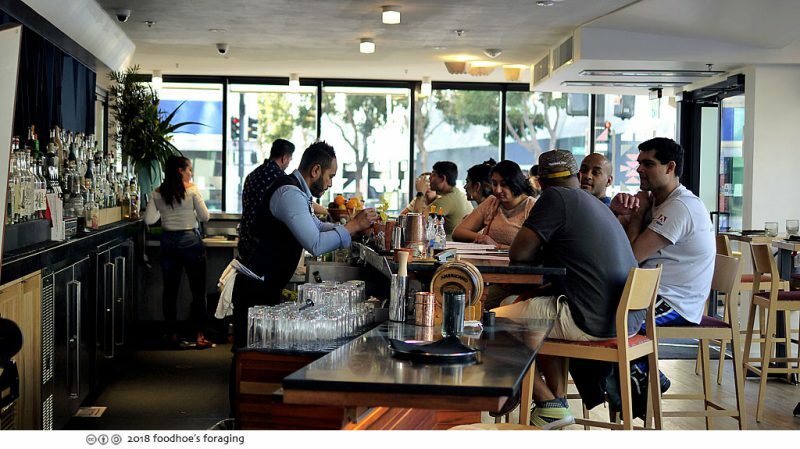 The dining room was designed by Arcsine, the design firm that did Calavera, Duende and Walnut Creek’s Teleferic, all stylish and artfully designed. The bar dominates the entrance, featuring an array of small-batch mezcals, Mexican craft beers and wines from Sonoma County. The counter is lined with bottles of the bartender’s handcrafted syrups, infusions, mixers and additives that are necessary to make their mezcal-based libations and artfully balanced cocktails. Mezcal is made in small batches, the leaves are cut off agave plants by hand into a pineapple shape, then roasted in underground fire pits which creates smokey flavors, then crushed, mixed with water to allow fermentation and finally distilled into the smokey smooth spirit that has become the drink of the moment. 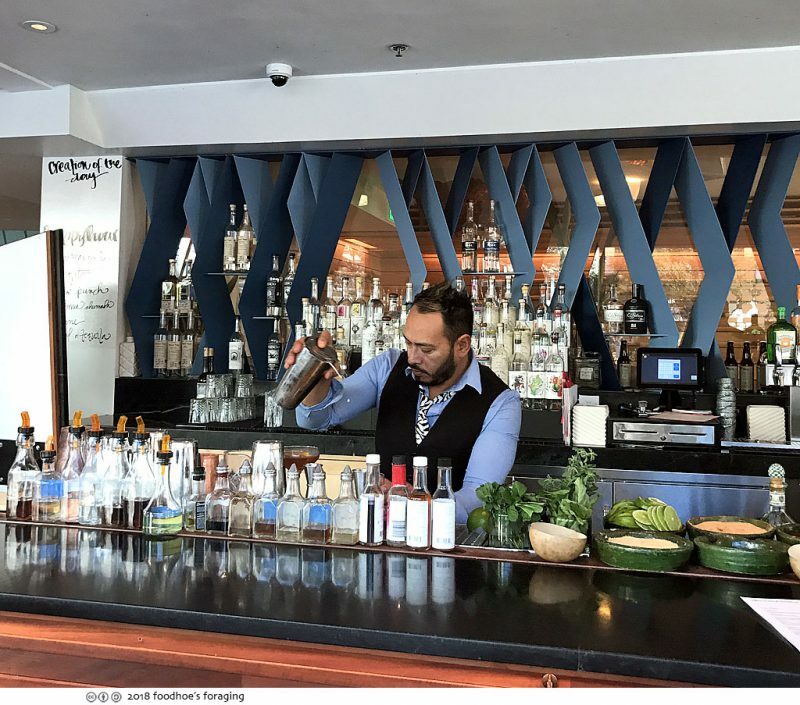 There is a full bar, but you should focus on the mezcal based cocktails, which offer intriguing interpretations of the classics along with inventive and beautiful new creations. 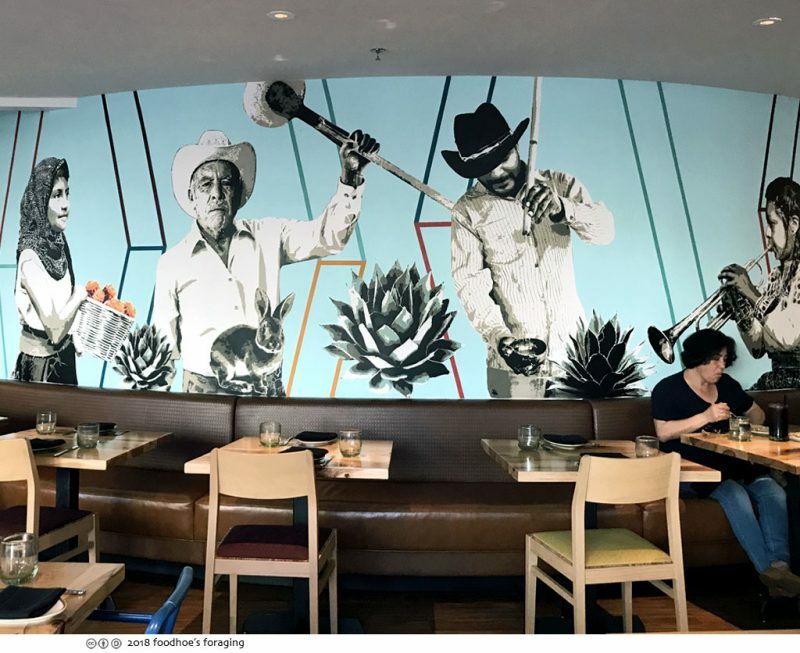 We dined as guests of the restaurant and enjoyed learning about mezcal and mole while pondering the striking mural by Lapiztola, an art collective based in Oaxaca who also did the murals for La Guelaguetza in SoCal. The artists create a compelling piece that symbolizes the restaurant’s dedication to authentic cuisine, the creation of mezcal, social empowerment, and community. We began with cocktails, Mr. K had a Bloody Mary made with mezcal, which had definite smokey undertones and was topped with a scoop of spicy salsa. I usually stick with wine or beer, but felt adventurous and tried the Amor Mixteca made with mezcal, pomegranate liquor, lime, orange and chipotle essence, garnished with dehydrated citrus that looked like sparkling jewelry and was rimmed with a lip smackingly spicy, sparkly mixture of salt and chili. The bartender checked in with us later to see what we thought of the cocktails. Everything on the menu sounded delicious and we wanted to try as many Oaxacan dishes as possible. 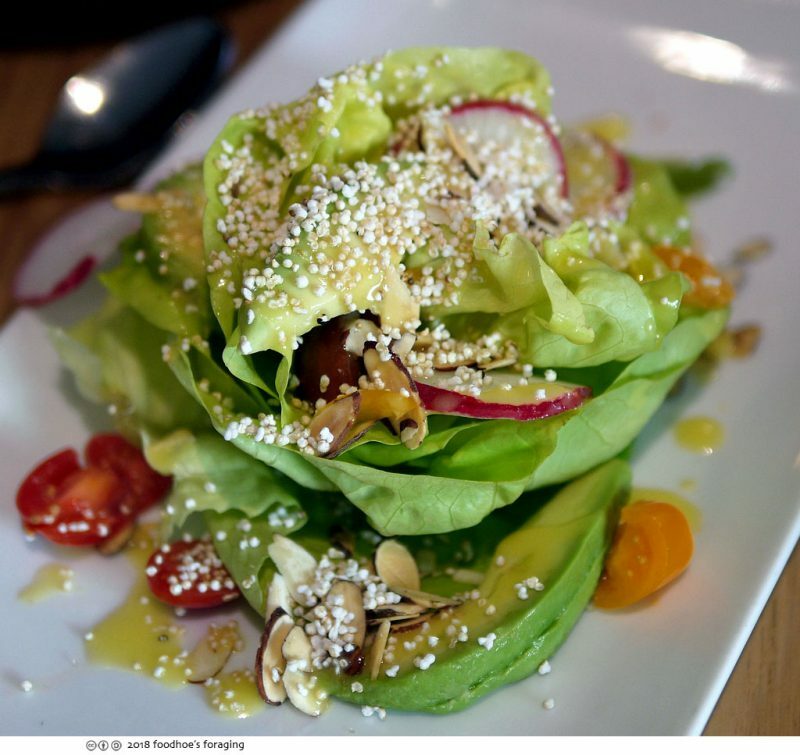 We began with the Oaxacan Salad a lovely plate of delicate butter lettuce, slices of avocado, mango, toasted sliced almonds, heirloom tomatoes, radish and tossed with a bright and vibrant mezcal passionfruit vinaigrette then sprinkled with crunchy amaranth seeds. It was light and refreshing, lots of excellent flavors and textures. 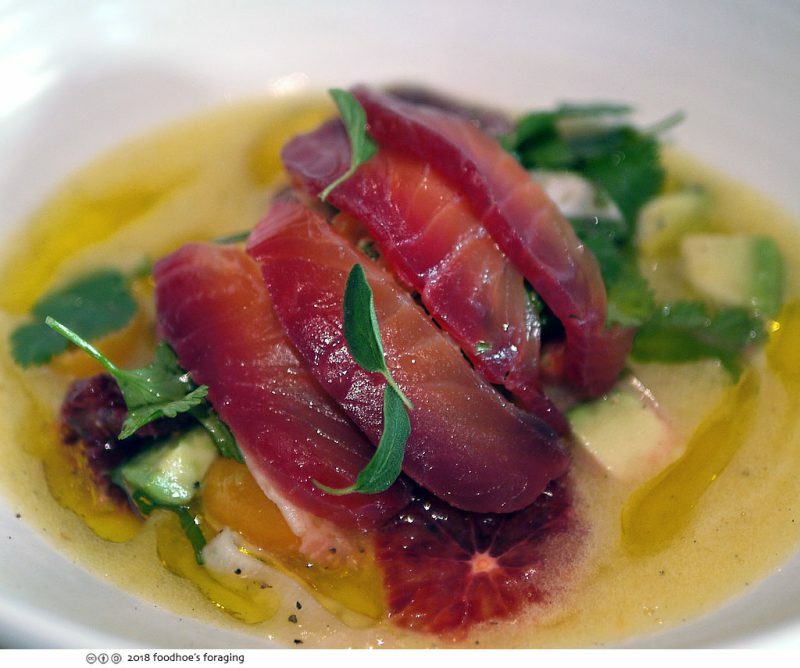 We couldn’t resist the non-traditional special of Salmon crudo served over shaved fennel, blood orange segments, chunks of avocado and fragrant cilantro bathed in a fantastic pineapple citrus habanero sauce that makes me drool just thinking about it. The salmon was cured with beets which imbues the beautiful orange flesh with a rich garnet hue and cardamom gives a rich spicy aroma, Mr. K thought it was the best thing ever. 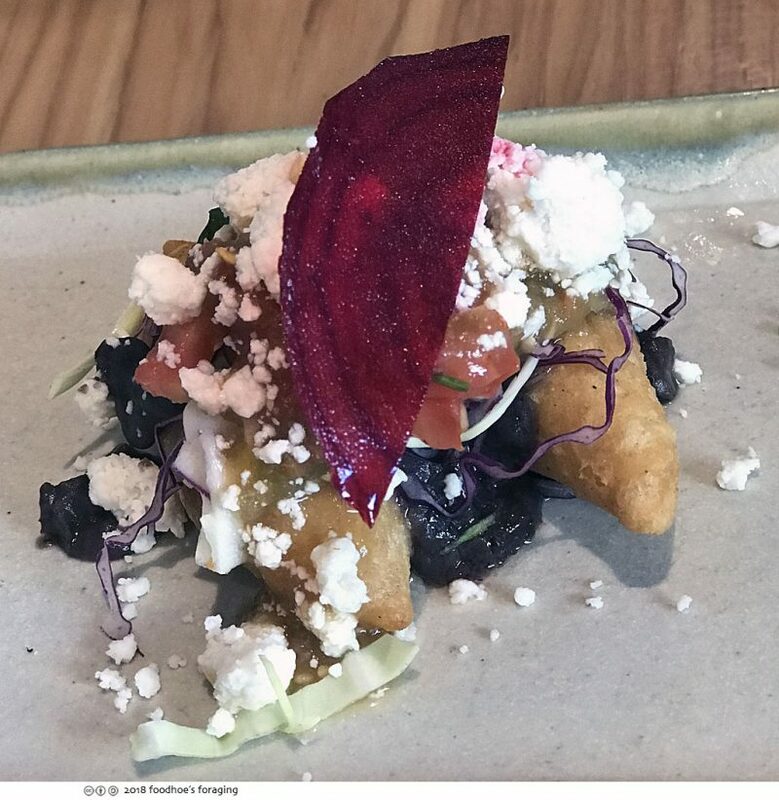 We loved the Molotes, which are torpedo shaped dumplings made from masa filled with chorizo (spicy sausage), epazote, potato and cabbage served with black bean puree and topped with queso fresco, pico de gallo and some fresh vegetables for garnish. 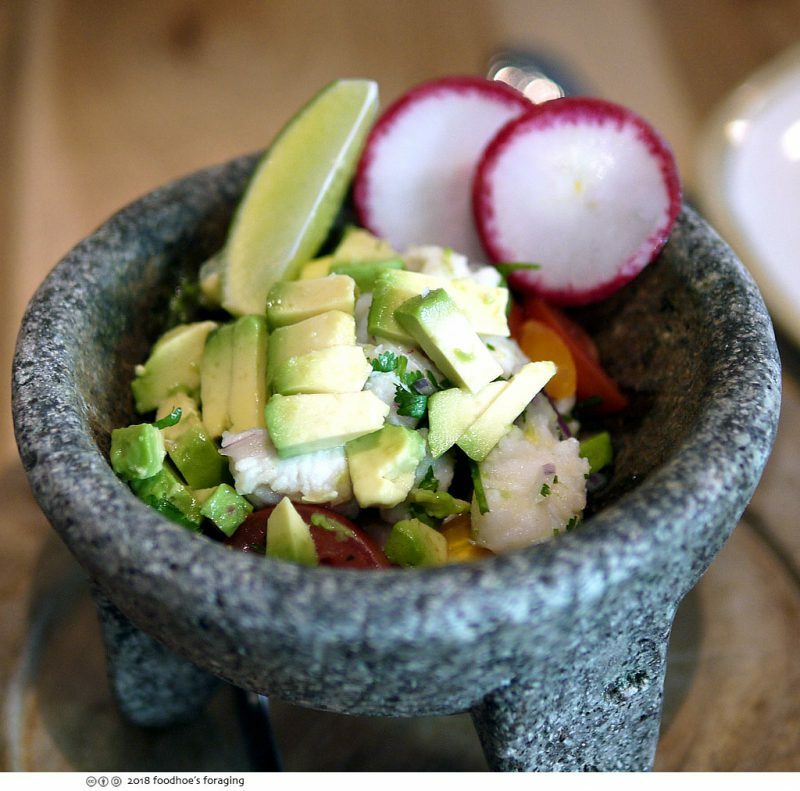 The Ceviche was served in a molcajete, a stone bowl that has been a staple tool in the Mexican kitchen for over 6000 years that is used for grinding various food products. This was a special of the day and made with chunks of really fresh sea bass, avocado, tomato, onion, fresh lime juice and cilantro, perfect flavors and so good! I decided to forego the Tlayuda which was described as huge and instead had the Molcajete Mixto, a magnificently spiced stew full of classic ingredients such as tasajo (tender thin slices of beef), grilled chicken, prawns, topped with grilled onions & peppers, slices of nopal, topped with melted cheese. 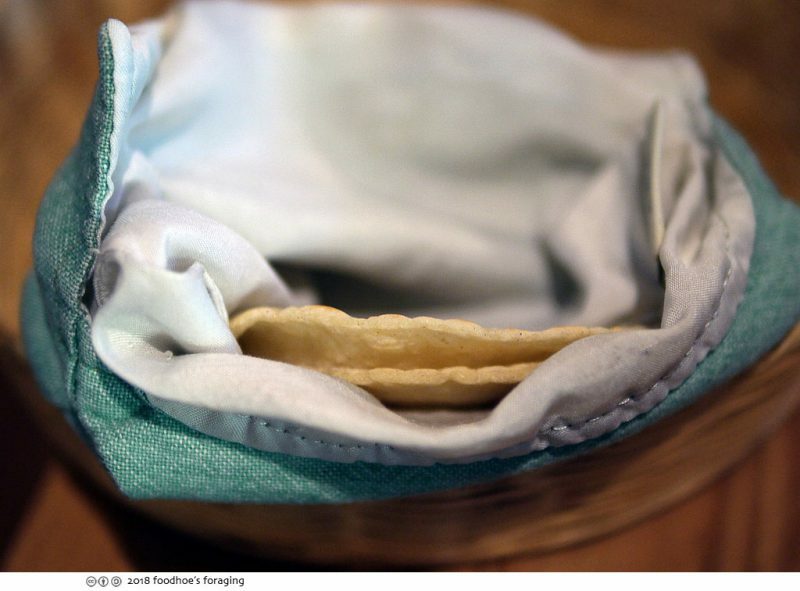 It was so flavorful and full of many diverse bites to delight our tastebuds as we scooped our way through the bowl and savored the house made tortillas, rice and black beans, . 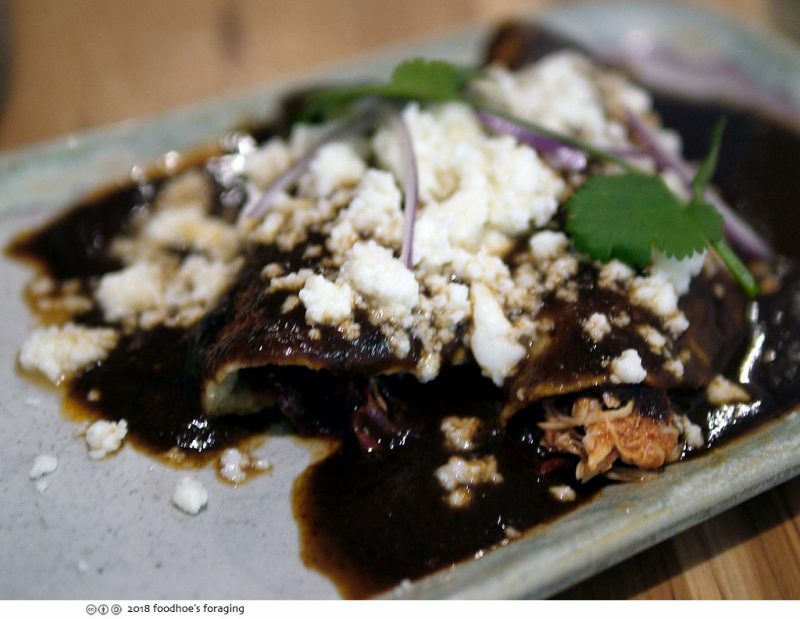 The Enmoladas are soft tacos filled with braised chicken bathed in a rich Mole de Oaxaca which tastes smokey, spicy, and a little sweet. It is brilliantly accented by the addition of queso fresco, sliced onion and cilantro. Oaxaca is famous for its moles which are complex chili-based sauces with many ingredients that require separate roasting or blanching or toasting and can take days to finish. 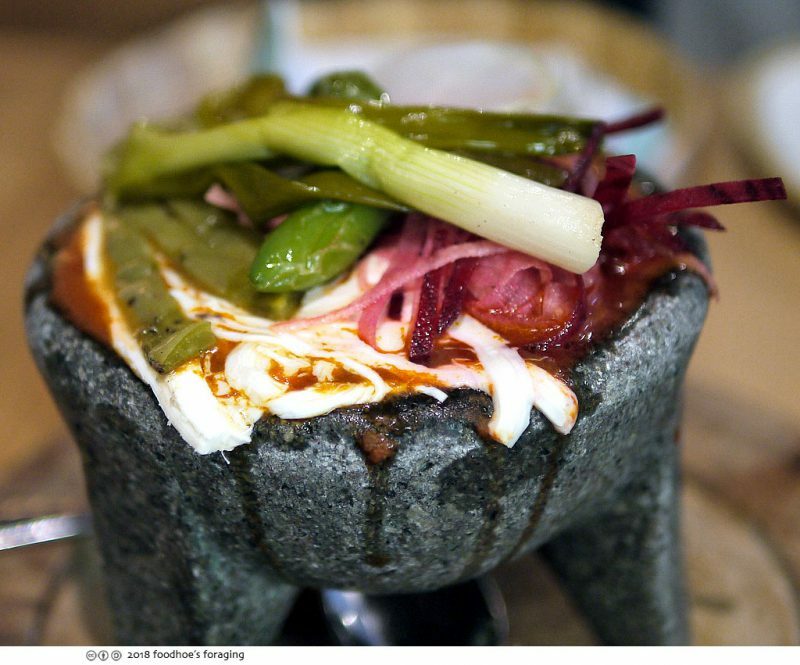 Chef uses his mother’s recipes that have been passed down from generation to generation and are made from over 20 secret ingredients that he brings from Oaxaca several times a year. The moles are available in jars for sale too. We soldiered onto dessert with Churros drizzled with cajeta which is a thick, sweet confection made from boiled milk with a scoop of tequila and another of chocolate mole flavored ice cream. 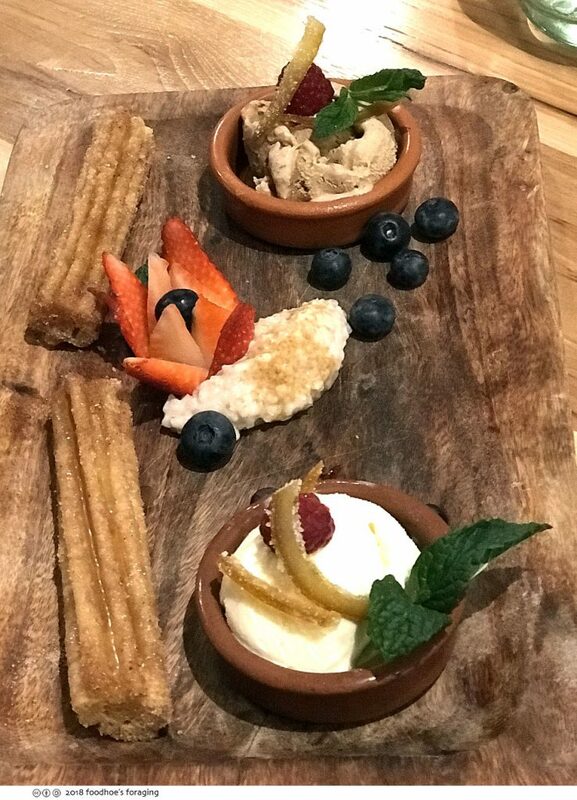 The ice creams were amazing, rich and creamy with beautiful flavors that perfectly complimented the delectably crunchy, cinnamony churros. Tucked into the platter was a scoop of creamy Arroz con Leche (rice pudding) served with seasonal fruit and candied citrus rinds. 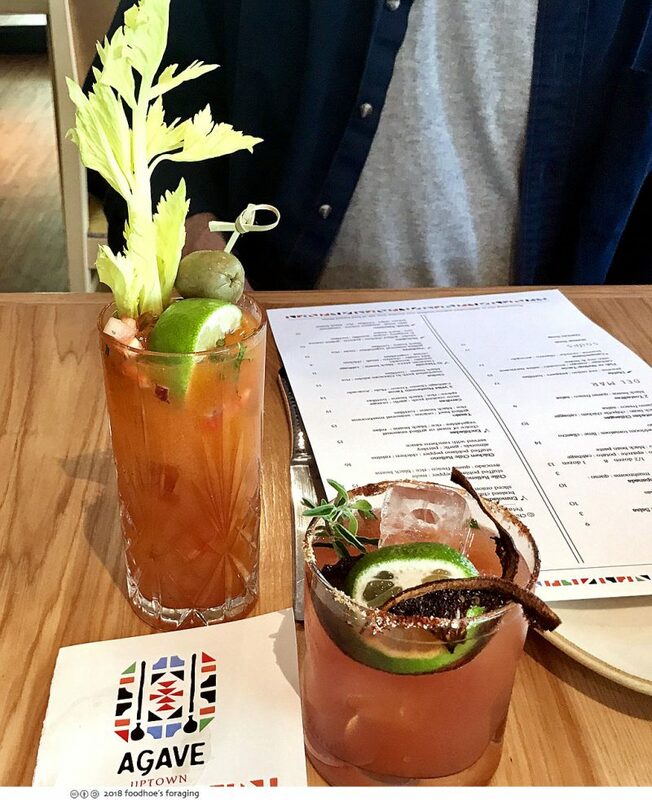 We had a great time sampling the flavors of Oaxacan cuisine and learning about mezcal and mole. I am definitely going back for the Tlayuda (organic crispy corn tortilla covered with black beans, cabbage, queso Oaxaca and avocado) and hope that they will serve brunch on the weekends one day. Thanks Agave Uptown for such a warm welcome and feeding us such a heartfelt and delicious meal! yes, we are spoiled in California with so many great chefs introducing us to their native cuisine!